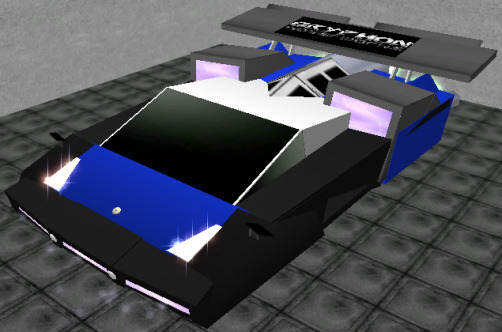 With the beginning of the 5th generation of Gryphon Hoverworks crafts, engineers again turned to the racing world to develop the successor to the very fast, but very large GTR-7. Taking design concepts proven in the Veloce GTI model, Gryphon's engineers created the GTR-8, a craft which matches the GTR-7 in speed, but due to its lighter weight has greater manuverability and acceleration. The basic design was based on a much sleeker, more angular version of the GTR-7, with a single collector in the front and two flanking the engine. The engine is another custom design for the GTR series. Steering is controlled with a pair of thrust vectoring nozzles mounted on either side of the primary forward thrust nozzle. The forward collector, like on the GTR-7, is generated over an open duct, through which incoming air exits out the side vents in an upward direction, thus providing the downforce necessary to prevent uncontrolled lift in high-speed situations.